Return Merchandise Authorization (RMA) Service is available for Customer, subjected to all purchased products from Brickcom. Customer should check and find the defective product firstly. Brickcom reserve the right to confirm if Customer’s RMA request is valid. The RMA Number would allow us to track your return much faster and easier. 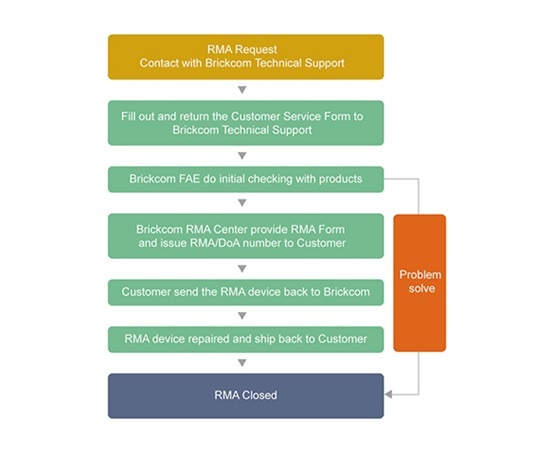 It can be obtained from Brickcom RMA Center after the Customer Service Form is completed. RMA number is only valid for 7 business days from the day RMA number issued. After obtaining an RMA number from Brickcom, you must send the product - freight prepaid - to Brickcom. The RMA number must be prominently displayed on the outside of your package. If you send your product to Brickcom without the RMA number prominently displayed on the outside of the package, it will be returned to you unopened. Please use a shipping company that can demonstrate proof of delivery. Brickcom does not accept responsibility for any lost shipments unless proof of delivery to Brickcom is provided. Brickcom will not repair or replace a module that is shipped in such a way that the product is not properly protected. Brickcom will not accept any product that has been damaged as a result of accident, abuse, misuse, natural or personal disaster, or any unauthorized disassemble, repair or modification. If you have any questions, please contact the Brickcom Customer Service Center by E-mail at support@brickcom.com.